Pine cone wreaths make a great decoration for your home during the holidays or any time of year. If you have pine cones in your yard, don't simply throw them out. Collect the prettiest ones and set them aside for wreaths. You can also purchase pine cones from home and garden centers or craft stores. Create a simple pine cone wreath for your home and personalize it to fit your style or the season. Collect pine cones from beneath a pine tree on your property or purchase some from a craft store. 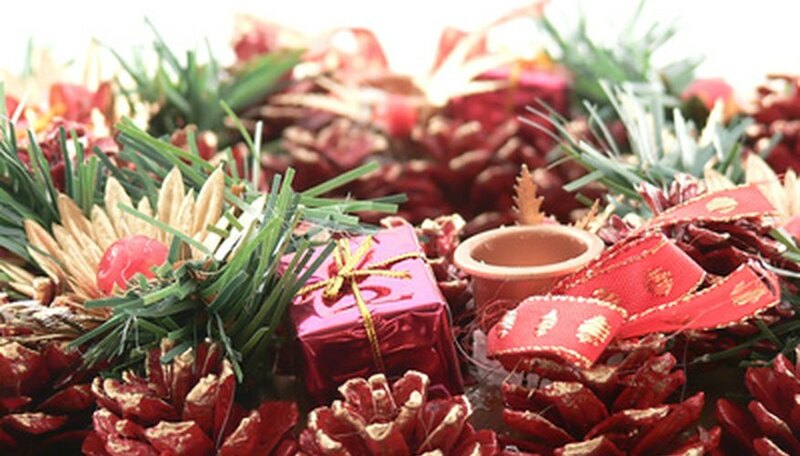 The number of pine cones you will need will depend on the size of both the pine cones and the wreath you select. Brush any dirt or debris off of the pine cones, being careful not to break off any of the pieces. Purchase a grapevine wreath from a craft store. Grapevine wreaths work better than foam wreaths for this craft because some of the wreath will show beneath the pine cones. Rustic-looking grapevines will work much better with the pine cones than white foam. Plug the glue gun in and insert a glue stick. When the glue gun has warmed up, begin placing pine cones on the wreath. Put the glue on the area of the pine cone that you want to stick to the wreath and press firmly until it has set. Begin with the larger pine cones and use smaller ones to fill any holes. Cover the grapevine wreath as fully as you want. Decorate the wreath with the ribbon you chose. Simply create a bow with the ribbon and glue it onto the top, bottom or side of the wreath. Alternatively, wrap the ribbon around the wreath before adding the bow. Add any other decorations you desire. For example, during the holidays, glue jingle bells onto the wreath. During the holidays, glue real or fake holiday leaves onto the wreath. Glue cloth flowers onto the wreath as a decoration for the spring or summer time. Leave the wreath lying on a flat surface for 24 hours before you hang it up so that the glue completely hardens.